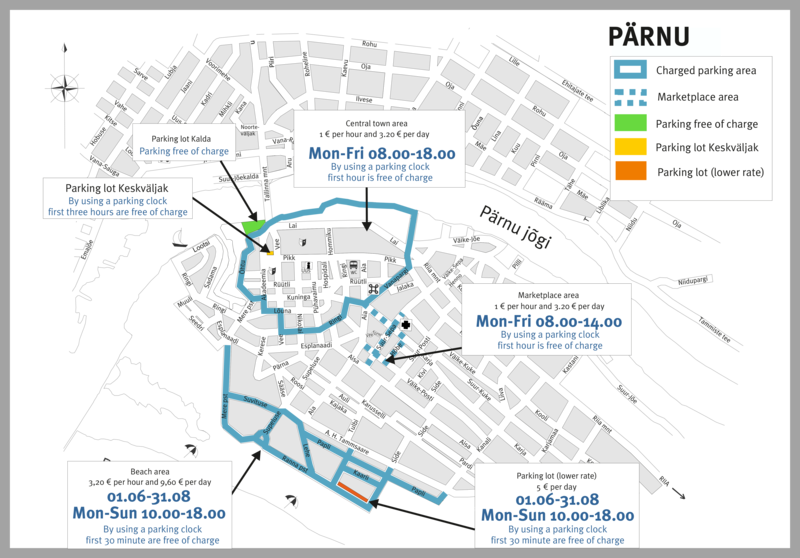 - Parking is charged on weekdays (Monday-Friday) from 8.00 to 18.00. - Parking is charged on weekdays (Monday-Friday) from 8.00 to 14.00. NB! The first hour in the central town area and first 30 minutes in the beach area of parking are free of charge, if the driver is using a parking clock or written notice fixing the starting time – placed visibly on the windscreen of the vehicle. The parking clock or written note with the arrival time must be displayed behind the windscreen and must be easily visible. NB! Leaving the car (to by the ticket, etc) please make sure you have to placed the parking clock or a written note fixing the time visibly on the windscreen!! !